Andrew Kellaway scored a first-half hat-trick as the Wanderers took a huge step towards the semi-finals of the Premiership Rugby Shield on Monday night. Matt Worley added two further tries, one of which claimed the bonus point, with Tom Collins also on the scoresheet in an eventful 40-36 success against Northern Conference leaders Newcastle Falcons at Franklin's Gardens. The Falcons mounted a fine comeback during the second period and had edged ahead at 29-26, but Worley and Collins scored to ensure it would be the Wanderers who earned a maximum haul. It means the Saints second string have strengthened their grip on second spot in the table, putting them on a likely collision course with Exeter Braves in the final four. Exeter are currently well clear in the Southern Conference and the Wanderers now need to win their final match, at home to Leicester on April 20, to ensure what is set to be a trip to Sandy Park. The Wanderers did well to recover early on against the Falcons, who took the lead at the Gardens when wing Morgan Passman made a brilliant break from halfway, beating several attempted tackles before offloading to Pedro Bettencourt for the score. Tim Swiel converted, but the Wanderers bounced back immediately thanks to some tidy combination play down the right between Kellaway and Worley, with the Australian centre applying finishing touches. James Grayson added the extras to level things up and there was plenty of huff and puff in the next period of the game, with former Saints Academy No.8 Simon Uzokwe impressing. But Uzokwe was forced off after taking a big hit and the Wanderers soon scored again as Kellaway wriggled his way through. Grayson hit the right post with the conversion, leaving the Wanderers' lead at 12-7. But there was more to come from the hosts on the brink of half-time as a flowing move involving the likes of Fraser Strachan and Grayson ended with Kellaway bagging his hat-trick. 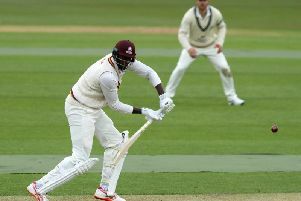 Grayson slipped but still managed to convert well as his side ensured they would hold a 12-point lead at the interval. The Wanderers were forced to do some defending early in the second period as Newcastle came out of the blocks quickly, with battering ram lock Tevita Cavubati influential. The Falcons eventually had their try as scrum-half Cameron Nordli-Kelemeti picked up from a ruck and darted over the line. Swiel added the extras and the Wanderers' lead was down to just five points. But the home side produced a strong response as Grayson offloaded and Worley cut in from the right before turning on the turbos to dive over the line. It was the bonus-point try for the Wanderers, and skipper Grayson kicked the conversion with ease to take the score to 26-14. But Newcastle again issued a riposte as a mix-up allowed Joel Matavesi to score his side's third try of the night. Swiel again converted before the Wanderers withdrew key men, Kellaway, Grayson and Mitch Eadie. The Wanderers' lead was now looking increasingly precarious as Swiel added a penalty to the tally. And the Falcons fly-half soon had a try to his name as he showed good strength to score in the corner. He missed the conversion, but Newcastle now led 29-26, having produced an impressive comeback. The Wanderers were not done though and after guest lock Freddie Betteridge did brilliant to break the Newcastle line, Collins ran a lovely support line and gathered the offload to score. Replacement fly-half Robbie Povey converted to make it 33-29 and the Wanderers had real breathing space when Worley scored his second try of the night soon after. The wing was able to race in after guest flanker Keifer Laxton did some fine offloading work close to halfway and Tom Emery delivered the assist. Povey converted again, but Newcastle again bounced back as Swiel scored his second. He also converted to cut the gap to just four points with five minutes to go, but there were no late heroics from the away side. Wanderers: Emery; Worley (Dayes 72), Kellaway (Freeman 57), Strachan, Collins; Grayson (c) (Povey 57), Davies (Tupai 64); Davis (Trinder 60), Newman (Taylor 60), Ford-Robinson (Garside 72); Betteridge, Jubb; Laxton, Onojaife, Eadie (McNulty 57). Newcastle Falcons: Arscott; Passman, Bettencourt, Matavesi, Wacokecoke; Swiel, Nordli-Kelemeti; Brocklebank, Socino, Mavinga; Young, Cavubati; Farrar, Collett, Uzokwe. Replacements: Blamire, Woodward (Newcastle University), Caudle (Junior Academy), Ransom (Newcastle University), Marshall, Elliott, Wilson, Pascoe (Junior Academy).